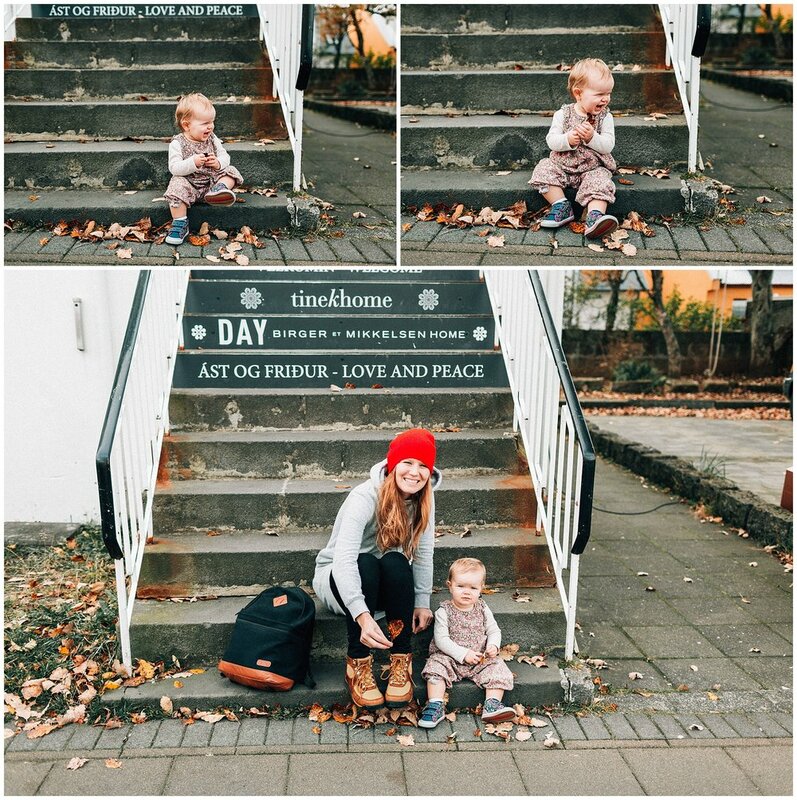 In the beginning of October we spent 10 days traveling in Iceland with our 1-year old baby Ruby. 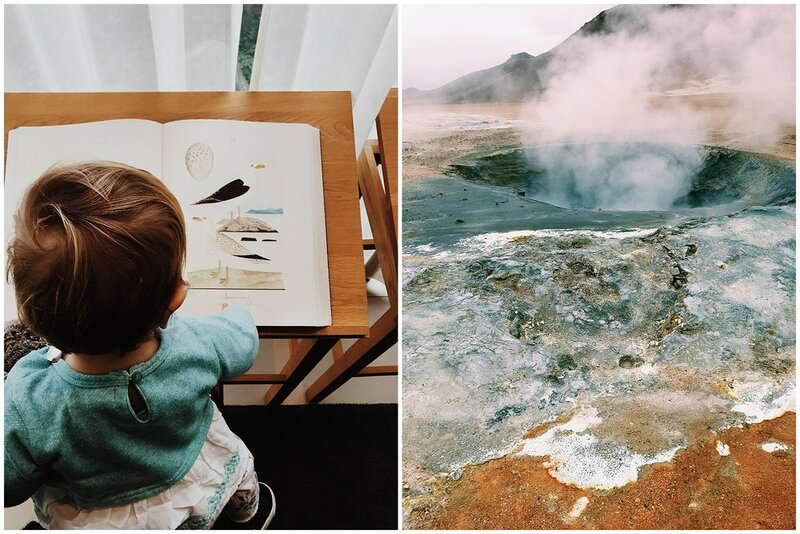 With destination wedding photographers as parents, Ruby had already done her share of flying, traveling and sleeping in new places, but this adventure got us, her parents, thinking more deeply about why we travel, and specifically why we would (or wouldn't) travel internationally with children. 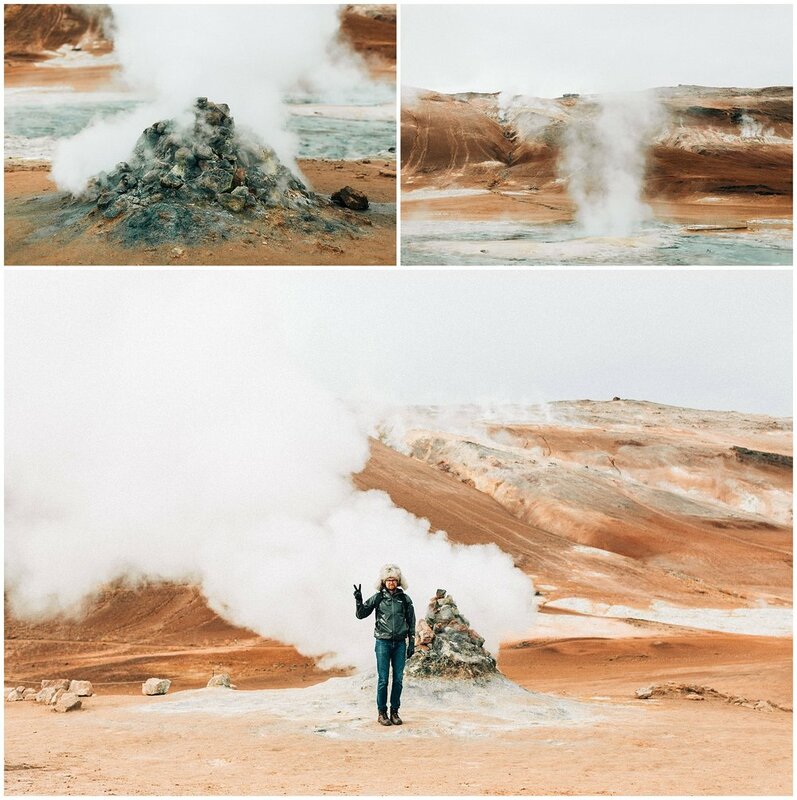 The majority of Icelandic blog posts document travelers doing things like repelling from ice canyons and soaking in remote hot springs. Our trip looked quite different! Before we left, Tommy and I talked and decided to have few expectations, to let the trip be whatever it might become. Our goal was to take each experience no matter how big or small, as part of our very own story to be cherished! This turned out to be a good attitude because with cold temperatures and quite a few rainy days, our willingness pack Ruby up the glaciers and out into remote hot rivers wained. Even so, we spent spectacular moments together. We arrived in Reykjavik on a Tuesday morning. Ruby slept all of two hours on the 7 hour flight and Tommy and I were pretty exhausted from juggling her on our laps the whole way. We pretty much let her watch all the TV she wanted (which wasn't much), eat copious amounts of snacks and take up any part of our seats or laps that she wanted. She was queen. We were her servants. Tommy, having lived in Hong Kong where bus tours were a dime a dozen, had the foresight to book a tour of the famous Ring Road first thing upon our arrival. We kind of knew we'd be beat after the long flight with a baby and he suggested that on the tour we'd be able to nap in between stops and catch up on the significant jet-lag. A great move! 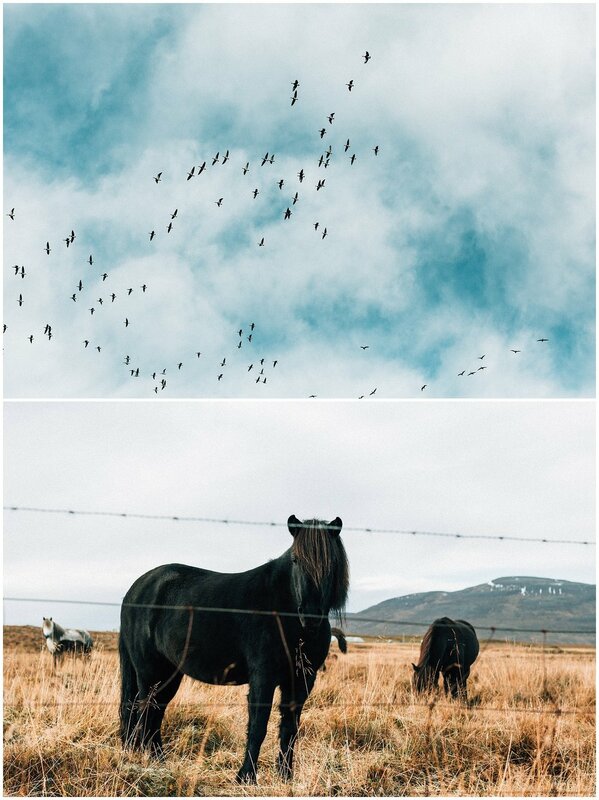 A couple hours after touching down in Iceland, we were out in the countryside taking in the views. The tour provided a car seat for Ruby which she snoozed in on and off throughout the day. We were nervous to know if we would have car seats available (reviews online are confusing and some are very old) but we had no problem with this. Even when we picked up our own rental car, they were happy to provide us with a car seat. The ring road tour gave us a bit of everything. Beautiful geysers, glorious parks with impeccable boardwalks, and awe-inducing waterfalls. 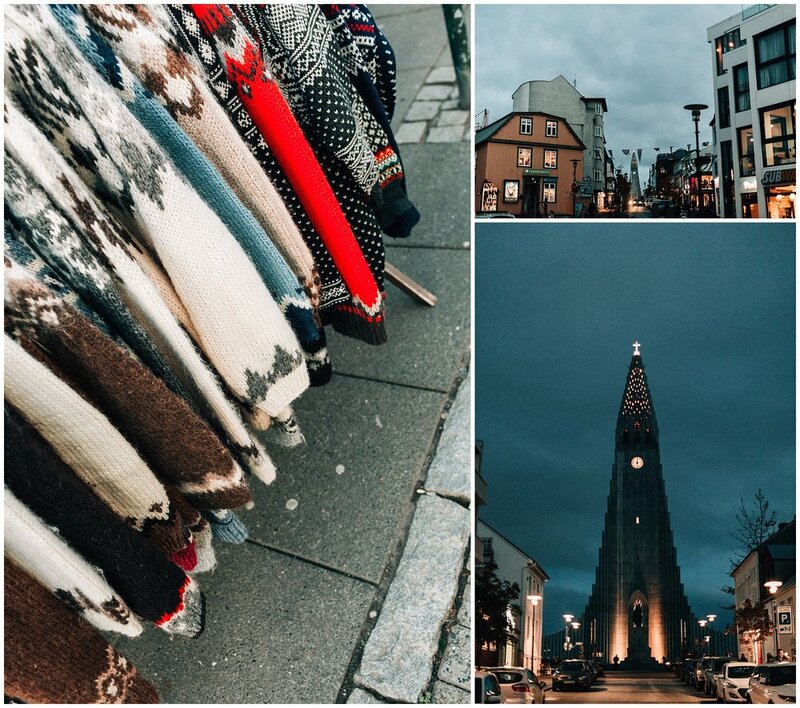 Our tour finished around 6 p.m. that first day in Iceland and we were shuttled to our Airbnb just down the street from the big iconic church Hallgrímskirkja. Bathing and bedtime routines were...interesting. 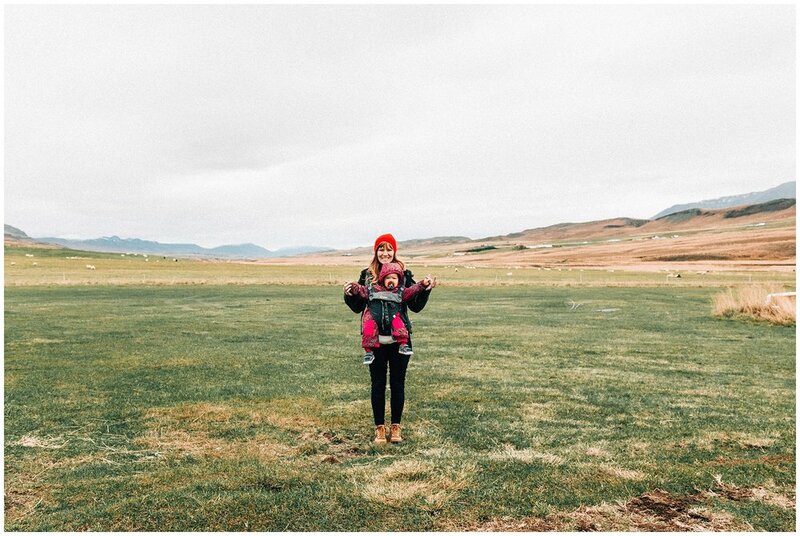 However, I have to take this opportunity to say: Iceland is absolutely baby friendly. Not only did most of our Airbnbs provide a crib, but many of them provided baby bathtubs, crib bedding, and even toys for Ruby to play with. Sandboxes and play gyms are at every corner. What we didn't anticipate was the disruptive jet-lag Ruby would have. She napped well during the day but then it came to bedtime and her normal bedtime of 7:30 p.m. stretched late into the night...11p.m., midnight. There were a couple moments where all we could do was laugh at the ridiculousness of those first nights: Tommy and I begging Ruby to go to bed, her not showing the slightest sign of fatigue. There were one or two places where a crib wasn't provided. Those were Ruby's favorite nights because she got to do her very favorite thing: co-sleep...aka, nurse alllll night longgggg! Woohoo! 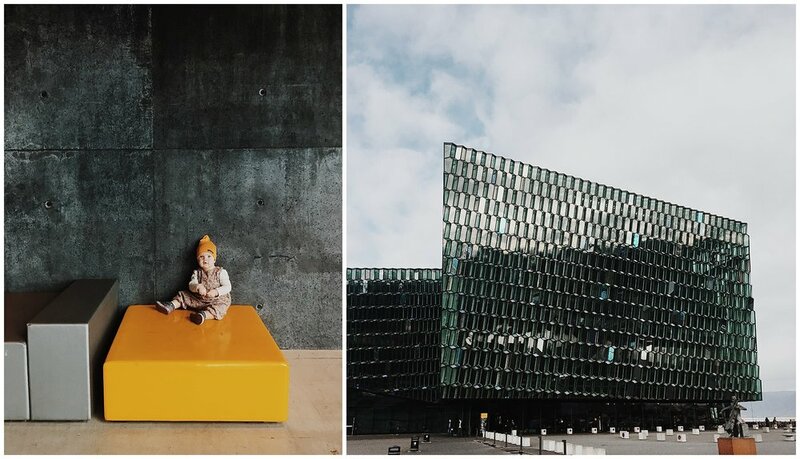 One of our favorite stops of the trip was to Harpa, the eye-catching opera house in Reykjavik. Being design enthusiasts, we were able to explore the big open spaces and incredible structures while Ruby could run/play/roll on the big open floors. We had the place to ourselves. Harpa was originally a privately funded project but after the country's economic crash in 2008, the building was put on hold until the government decided to pull together funding to finish it. They held the opening concert in 2011. One local told us that Iceland's citizens questioned the use of precious funding during that time on something that seemed so frivolous. But as the economy climbed back out of its hole, this structure served as a center for culture, arts and tourism and seems well-worth the cost of construction. Reykjaviks love of color put me right at home. 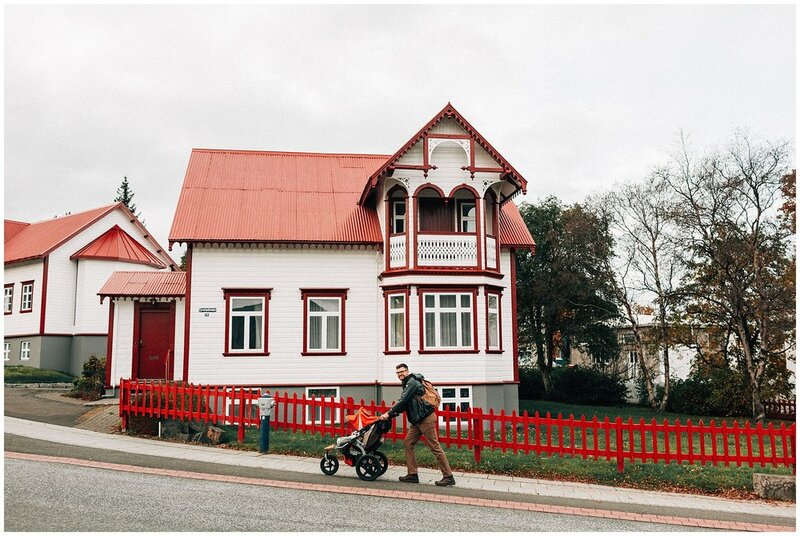 We had a total of four days there and maybe it was our slower pace with a baby, but it was just the right length of time, allowing us to soak up every coffee shop visit, bakery splurge, thrift store stop and even a visit to the Viking Museum. The views from the top of Hallgrímskirkja church were everything I'd dreamed of. We loved exploring this city. Eating through town, while expensive, was a definite highlight! 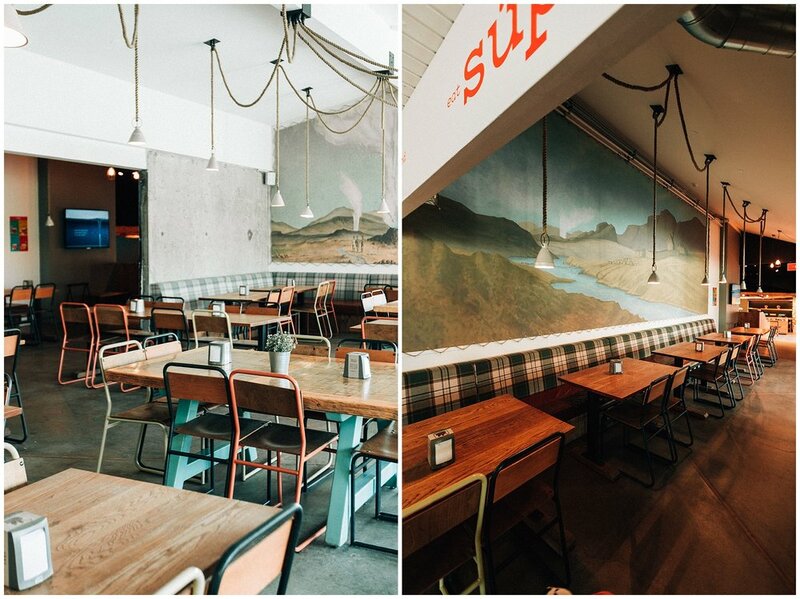 We visited Sandholt multiple times and enjoyed a pause in the adorable and classic Reykjavik Roasters before venturing back out into the rain. Notice our classy plastic bag rain shield for Ruby: nothing but the best for our girl! One of the main ways our trip differs from most Icelandic getaways I've read about is that we were all about those farm animals. 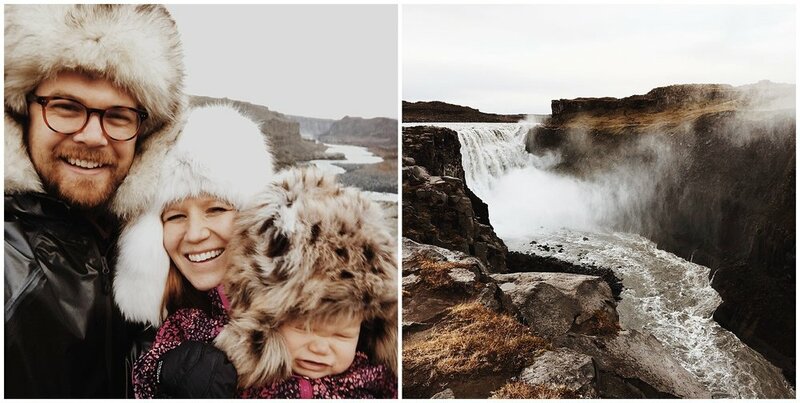 It was much more fun for us to watch Ruby enjoying Iceland than to try to enjoy something ourselves but have her be miserable. 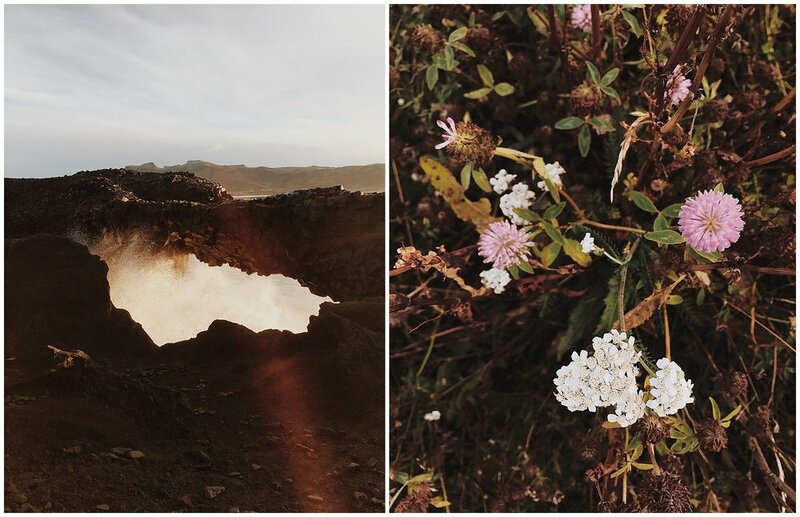 We stumbled upon an app called "Handpicked Iceland" that allowed you to see a variety of categorically organized sights on a map. We hit up most of the "kid-friendly" stops and none of them disappointed! 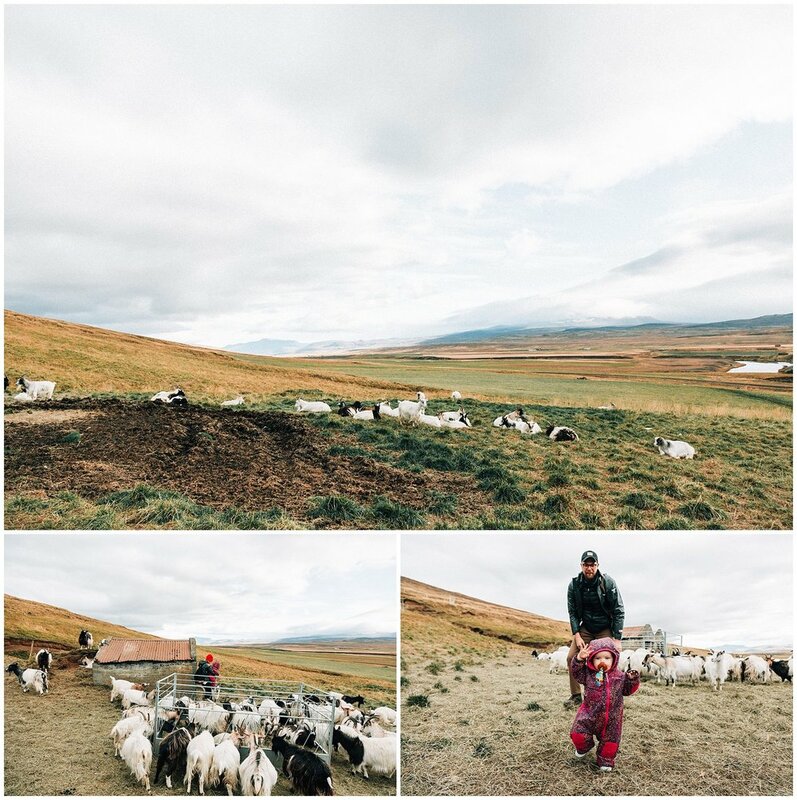 The Haafell Goat Refuge takes you a bit off the beaten track out into the countryside. But once you arrive, you're welcomed by a precious family and a host of baa-ing Icelandic goats. For 10 dollars a piece or so, the father of the family gives a guided tour of their "farm"...The Haafell goat is an ancient breed thought to be of Norwegian origin. At one point, on the verge of extinction, the government began subsidizing Haafell goat farms in order to recover the population. I was probably over-protective of Ruby at this stop because as a kid we had goats that looked really similar to Haafells, wearing the same curling horns and white beards, and I have a vivid memory of one billy goat charging me, my little hands latching onto his horns and holding on for dear-life as he tried to shake me to my death. (Insert Dramatic Pause.) This was a favorite stop of ours. To be out in the countryside exploring things off the beaten track was my dream. And it came true at Haafell Goat Refuge. 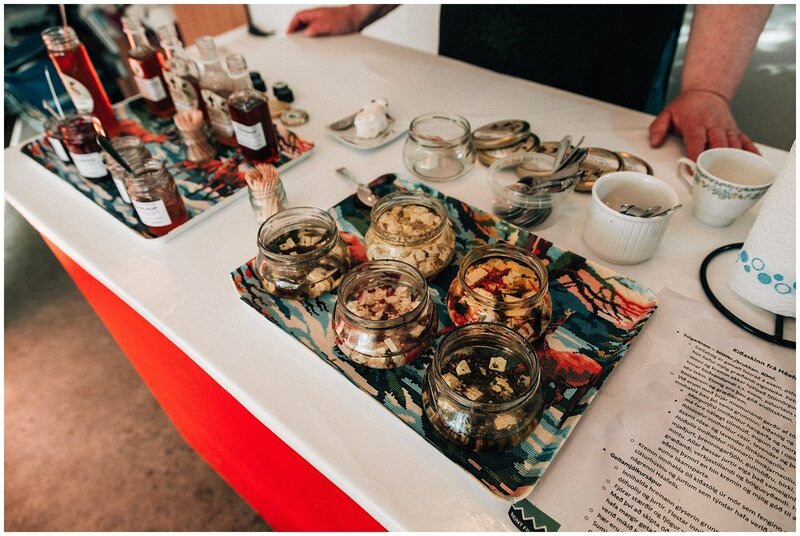 The grandmother of the family served us various goat cheeses and tea (all included in your 10$ fee) made from plants and flowers she'd grown during the summer months. It was special. The mother of the family invited Ruby and I to come for a play date in the back yard with her children Auschta and Berger. Babies will be babies and I love the little look Berger is giving Ruby...like, "Don't you dare take my soup pot!" It was here with Auschta and Berger that Ruby realized if she was going to fit in, she needed one of those wool hoodie/neckwarmers for the Icelandic countryside. All the babies had them. We invested in this fashion statement and it turned out to be much more than a fashion statement. Such a great way to keep wind and cold away from babies' necks and ears. We booked our accommodations mostly through Aribnb with the exception of one night in a hotel which we were able to book using our credit card points. Tommy somehow books the best spots (see our own personal sauna in our apartment?) while I end up booking shady trailers where the sheets don't seem to have been changed. He's gonna be in charge of the bookings from now on. Kaffi Kú was another of our favorite stops. A popular trend seems to be cow-shed restaurants where you can watch the cows feeding and being milked while drinking and eating products made there. We enjoyed lattes and waffles while Ruby stayed glued to the windows. It was by far our most peaceful meal in Iceland. After we finished eating, we went down and Ruby got to have some face time with the cows. Her pure joy was also ours. 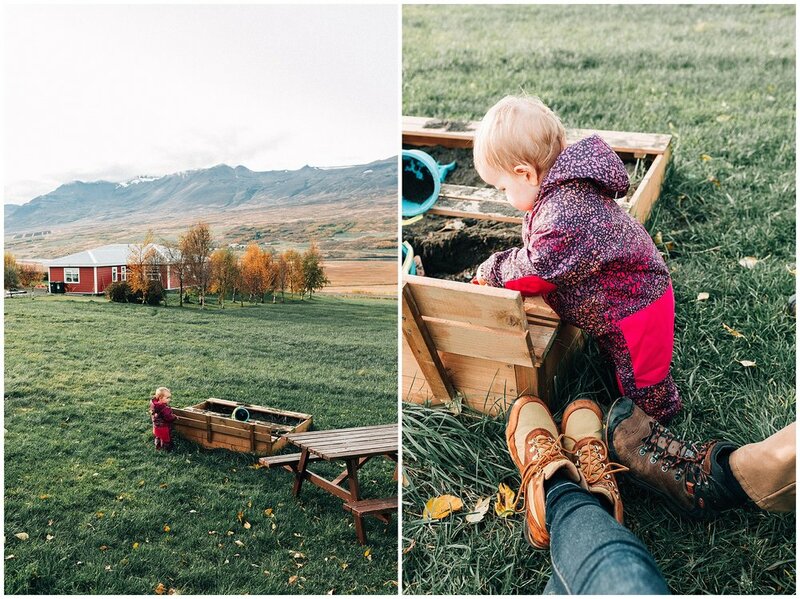 As I mentioned earlier, sandboxes/dirtboxes are everywhere in Iceland. Kids are definitely expected to be outside and communities make spaces for this to happen. I'll take this opportunity to mention that Ruby lived in her little Columbia snow suit. It was the best item we pack for her. We could put her in it, let her go adventure/roll in the mud, and then peel her out of it and put her back clean in her carseat. Essential. Having our own wheels gave us the ability to go at our own pace. It also allowed us to have a place for Ruby to nap. At one-year old, she was still taking 2-3 naps a day. This is another element that dictated what we saw and when: Ruby's nap schedule ruled. Now, we did wake her up to see a few things but mostly, we just keep traveling when she was sleeping, knowing there would be more spectacular things around the corner. You'll notice that quite a few of these pictures are shot out the window of a moving car. I don't mind this view: it simply reminds me that our sleeping queen was along for the ride. Fall befell us mid trip in the north. As we made our way to Akureyri the colors captured us. Icelandic colors win! We did most of our longer-distance driving early in the morning when we knew Ruby would be asleep. We'd snuggle her in her carseat and catch the sunrise on the road. We didn't plan to do it this way, but it turned out to be a treasure. Being a girl who has road tripped from the west to east of the US at least a half-dozen times and from north to south at least a dozen more, traveling the landscape at car-speed is something I've grown to cherish. We had Jonsi playing. We drank coffee. It was early and I'm sure I was grumpier than I remember at times, but I think fondly of those early mornings, rising before the sun and being able to watch her rise. The Myvtan steam vents boast two of the best (in my opinion) colors God created: teal and rust! Rubes rolled in the mud and tried to pick up the rocks. It was cute. Everybody got a little drippy when walking behind Seljalandsfoss. Especially bunny. Ruby's bunny was not clothed properly and got especially drippy! We made it to Fjaðrárgljúfur...this gorgeous canyon where I'm pretty sure some movie was filmed (it is other-worldly looking) but I can't remember which. Some serious wind was happening although it's not captured in the photos. Use your imagination! Little tip: Tommy and I both invested in Columbia OutDry Titanium Jackets. These were light-weight but completely waterproof and kept us from getting soggy! Highly recommend! We stumbled upon Grabrok Crater and the staircase up to the crater was probably more interesting to me than the crater itself. Iceland, with the influx of tourism, is faced with the challenge of facilitating environmentally friendly sight-seeing without ruining the ambiance of the natural terrain. This staircase did it magically. 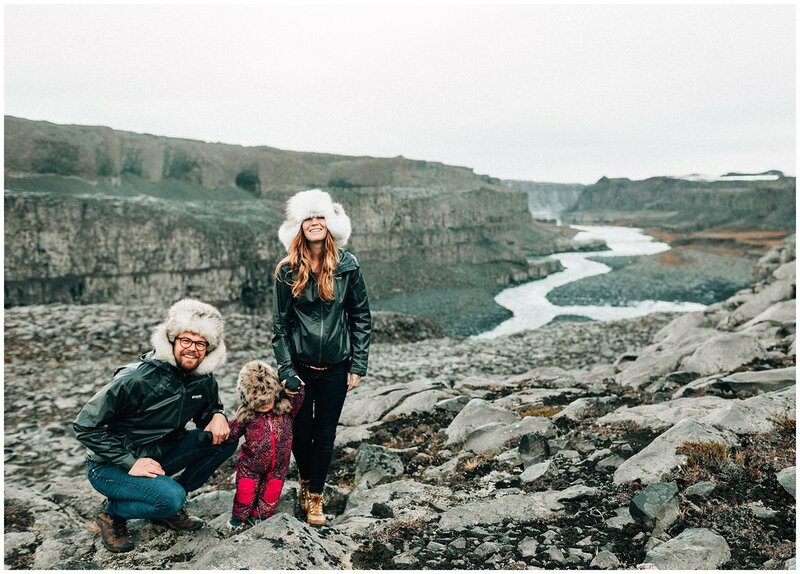 Also, notice the image above of Ruby sporting her Icelandic baby hood! Stylin! After another sunrise drive, we arrived at the Southern cliffs and spent our morning taking those in. Another element of traveling with a baby is that we often had our hands full of baby instead of camera. 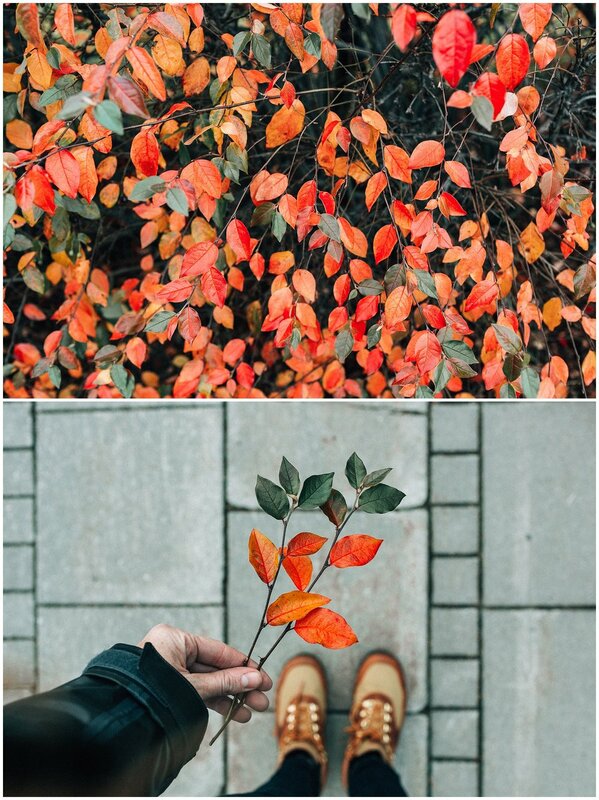 It pushed us to just experience certain adventures rather than document them and as much as we love capturing and experiencing the world through a lens and making art of it, it was freeing to put the camera down and enjoy the moments. I told you in the beginning that we did some thinking about why we travel at all and why/if we will travel internationally with children in the future. The trip really reaffirmed a couple beliefs/values we had before, and uncovered some new ones. The first is that travel (of this kind) isn't purely about enjoyment. It's really about personal growth. Because it's a lot of work to travel and you don't usually get to sleep in! We travel to learn. We travel to understand how other people do life. We travel to broaden our horizons (literally and figuratively) and become better citizens of the world. In this way, I hope we always travel with our kids, even if it means traveling to the far corners of Washington State itself. 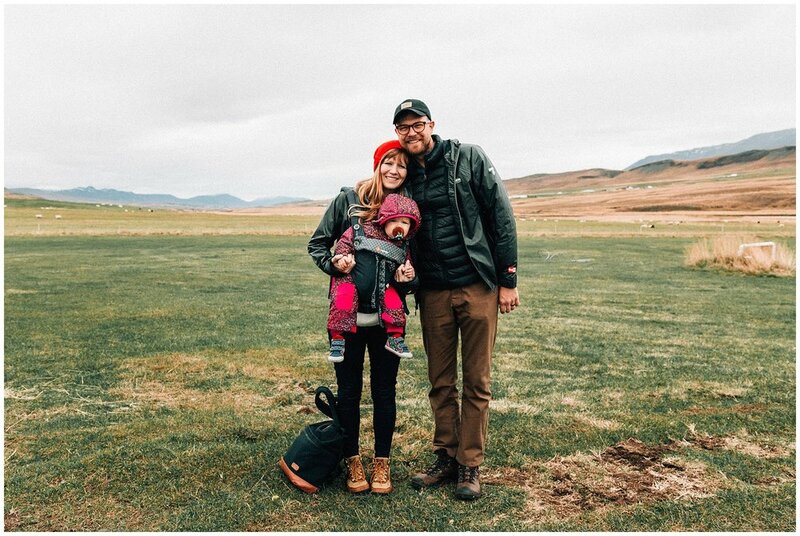 Secondly, we found that traveling with a baby to far off lands is a really just a more complex recipe (albeit still a great one) for giving your children chances to experience the world. At certain points we thought, "We traveled all this way to see goats and cows and stroller around a cool city in the rain--all things we could have done back home." And yet it felt bigger because we'd determined that..."This was going to be special. We were in Iceland. This was Icelandic coffee. And this was a vacation! It reminded me how glamorous small things can be if we decide they are. As long as you're setting aside time to be together and making plans for it to be special, it will be! Small plans with big attitude make for great adventures. I remember being on a work trip when I was about halfway pregnant with Ruby. I was staying in a lonely hotel room, missing Tommy as had happened on previous work trips, when all of a sudden I felt Ruby kick! I had a strange and beautiful sense that I wasn't alone. And it's been really good having her along ever since. Now, Tommy and I would love to go back to Iceland by ourselves and sit in that hot river everyone talks about. (Anybody want to elope there and bring us along to photograph it?) We'll definitely be taking vacations just the two of us. But there is no doubt about it: being together is special. And maybe someday when Ruby is stretching her wings and having rebellious moments and thinking we are mean, awful parents...maybe she'll come across these pictures of our silly wet smiles and remember how much we've always loved having her along.